The Bells Corners United Church Labyrinth is patterned after the Chartres Cathedral Labyrinth in France. It was built here to offer an alternative form of worship for all. The labyrinth is an ancient form of prayer that transcends the limits of still meditation: It is a metaphor for our spiritual journey and a powerful tool for transformation. As the weather permits, the outdoor, interlocking paving stone labyrinth is there for you anytime. It is well lit at night, and most weekday evenings the church is open for meetings and community groups to gather, so bathrooms are available. Come and pray alone or with family and friends. Many groups and individuals walk our Labyrinth: Support groups, families, individuals, friends, therapy groups, clergy, chaplains, nurses, health care providers, counsellors. If your group would like to book a room indoors, before or after your walk, please contact the Church Office at (613) 820-8103 or office@bcuc.org. 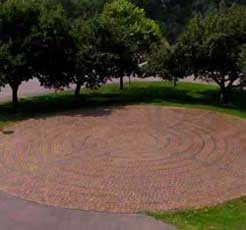 The Bells Corners United Church Labyrinth is featured as the Canadian Labyrinth in the book entitled Labyrinths - Ancient Paths of Wisdom and Peace written by Virginia Westbury. This book is a fascinating account of the modern labyrinth movement and its history. Our labyrinth was included due to its permanent nature, and the outreach and community involvement that surrounds it. All of the following resources are in PDF format.